Hello from my new dining room, friends! Also known as my office. Also known as that-room-that-shall-never-be-painted-or-redone-ever-again-or-my-husband-is-for-sure-leaving-me. That is not a joke. And have ended up with a completely different space. The room was lovely before, yes. 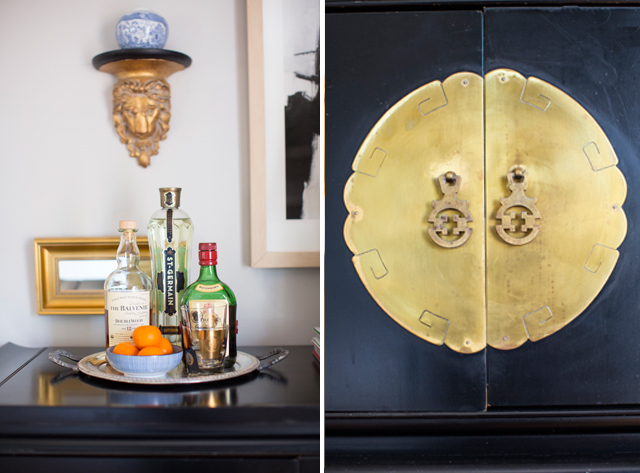 Dramatic, bold, and dripping with brass (my favorite!). But as I shared in week one of this challenge, I've learned that I love to look at bold spaces more than I love to live in them. With baby number two on the way and an office getting bumped for a nursery, I had to find a way to make this space do double duty. And we have accomplished just that! 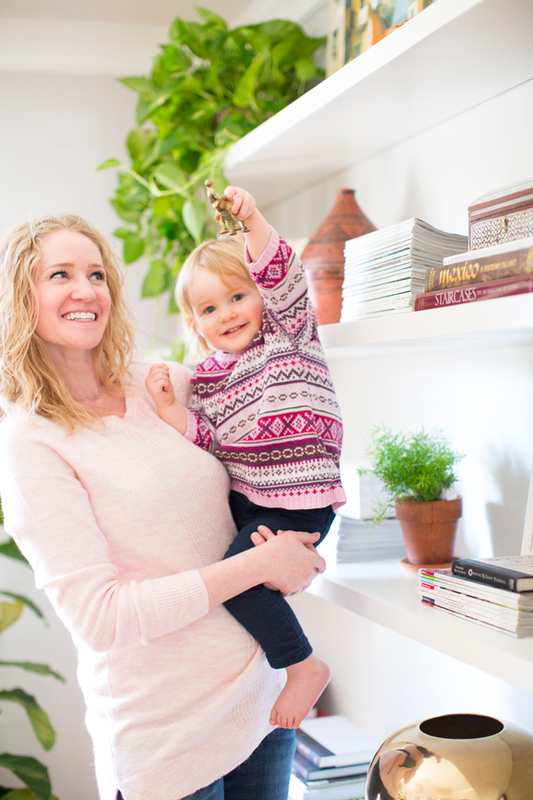 And you guys know I can't help but sneak Ava into these shoots. She just has such a ball showing off for the camera! First, the wall color. 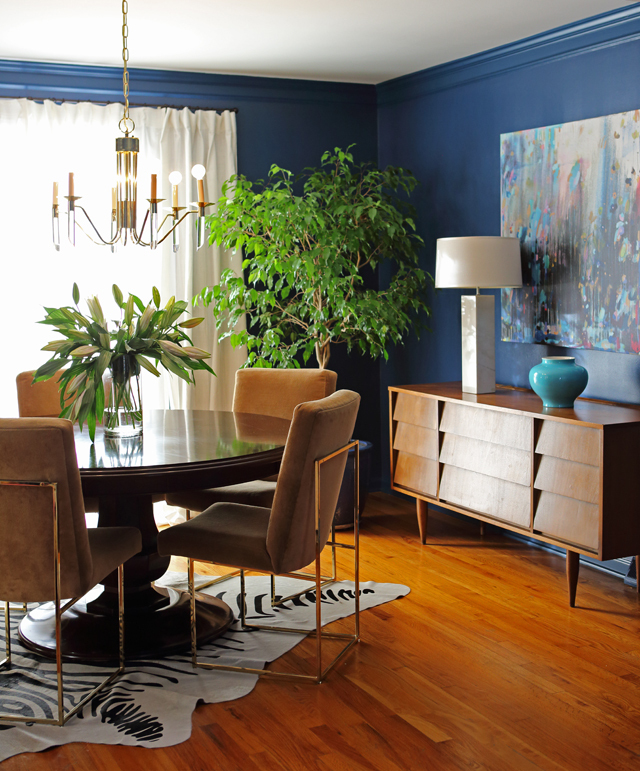 Walls and trim were both originally a glossy royal blue. With this makeover, the walls got 3 coats (yes, three in addition to a coat of primer - not fun) of Farrow and Ball Cornforth White in the Modern Emulsion finish. It's a glorious, soothing color! Trim is semi-gloss Benjamin Moore Simply White. Together, a wonderful combo. The table and chairs were pretty much the only elements that carried over from the previous space. Someday I will recover the chairs, but it's not currently in the budget so they remain as-is. I simplified the window treatments. What was once four drapery panels is now two, and they got a much-needed trimming so they barely kiss the floor. All of which made for a much simpler look. 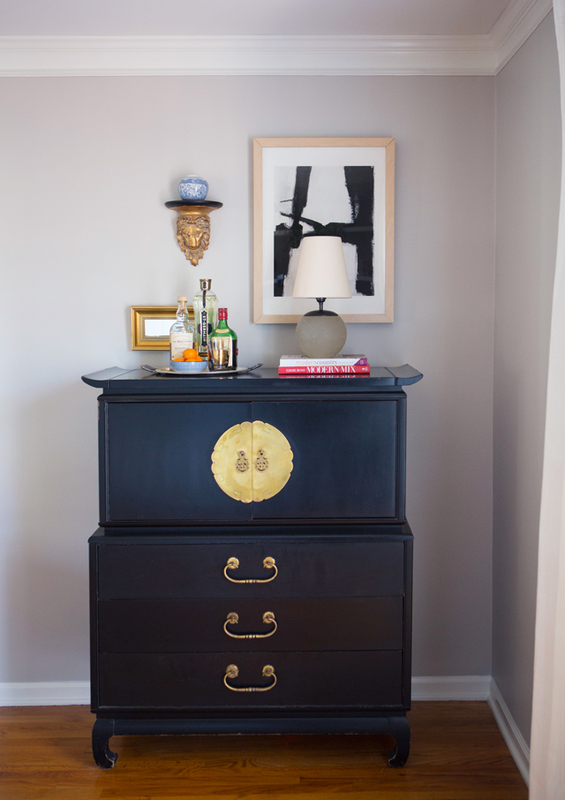 I created crazy amounts of storage by bringing in a very lovely Kent Coffee Amerasian chest. This is where the bulk of my dining linens, flatware, and bar accessories currently live. I love the unique lines of this piece, and the stunning brass hardware. I am a total sucker for good hardware! 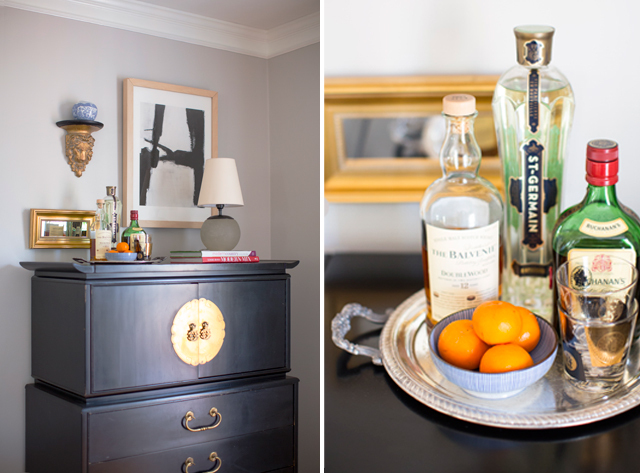 The simple bar setup lives on a silver tray my husband pulled out of a dumpster before we met (proof that you can find treasures anywhere!). 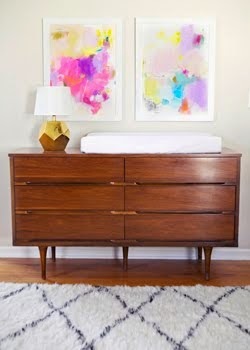 The pieces on the wall above are vintage and the art is by the incredibly talented Ilana Greenberg via sponsor Minted. We created even more amazing storage with a custom wall-to-wall floating credenza and shelving solution. This was a major major pain point with such a tight timeline (and a husband out of town for about half of the 5.5 weeks), but I think it was definitely worth it. At least, it will be when we forget how much blood, sweat and tears went into it. We had friends over the night before the photo shoot and I could not have been quicker or more proud to share that Eric planned and built it himself. Very much inspired by the ever-popular fauxdenza Ikea hack, every bit of this was built from scratch with lumber and supplies from sponsor Lowes. I'm trying to talk him into a follow-up tutorial, so hopefully I can provide one of those in the coming weeks/months. We're beyond happy with the results! I'm fortunate to have a side job collecting and selling beautiful things, and it's such a treat to display them in a space that we walk by several times each day. Until they go off to happy new homes, of course. There's also plenty (and I do mean plenty!) of room to display art (some of Ava's even! ), family photos, and the bulk of my extensive magazine collection. I love the mix of metals, clean white, and natural materials that make this room feel as comfortable as it is beautiful. 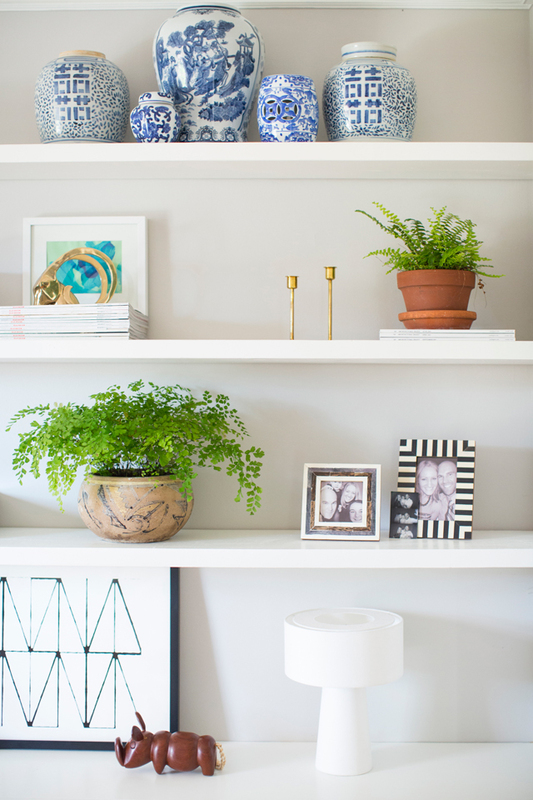 From braided seagrass baskets and found clay vessels filled with greenery to bright white ceramics and traditional blue and white ginger jars, everything creates a sense of balance in here. It's really come together in a way I kind of doubted it might. Whew. So that's that. Thank you to each and every one of you that came back each week to cheer us on! Thank you to Linda for her flawless coordination yet again. Big thank you to our generous sponsors, without whom this definitely would not have come to life. And biggest thank you to my family, who puts up with my crazy every time I choose to take on this One Room Challenge. It would never happen without your help and patience! Enjoy visiting the other 19 bloggers that took on this crazy challenge....and the many, many link-up participants as well! Congratulations, and beautifully done! I love all the art and objects on your shelves, and your dining chairs are still my favorite things. So good Tobe!! I'm dyyying over the floating shelves and credenza that your husband custom made - major kudos to him!! He's a keeper! 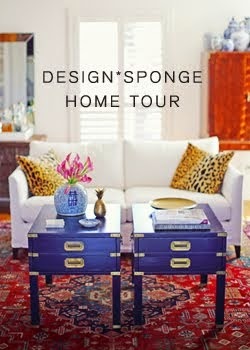 Love it all and I totally know what you mean about loving bold spaces but not sure about living in them. I'm the same way ;) Congrats lady on such a great dining/office space! Love the space! Amazing how massive the room looks and yet feels just like family. Congrats on baby number 2! You did a wonderful job. The room is lovely and very livable. Congratulations. Hello styling queen:) Of course I loved the before but when you throw in the white walls then you have me 100%! I can't help it:) This is a spectacular space and it is edited to perfection. I know you are thrilled with it and so is that cute little muffin...hee hee. 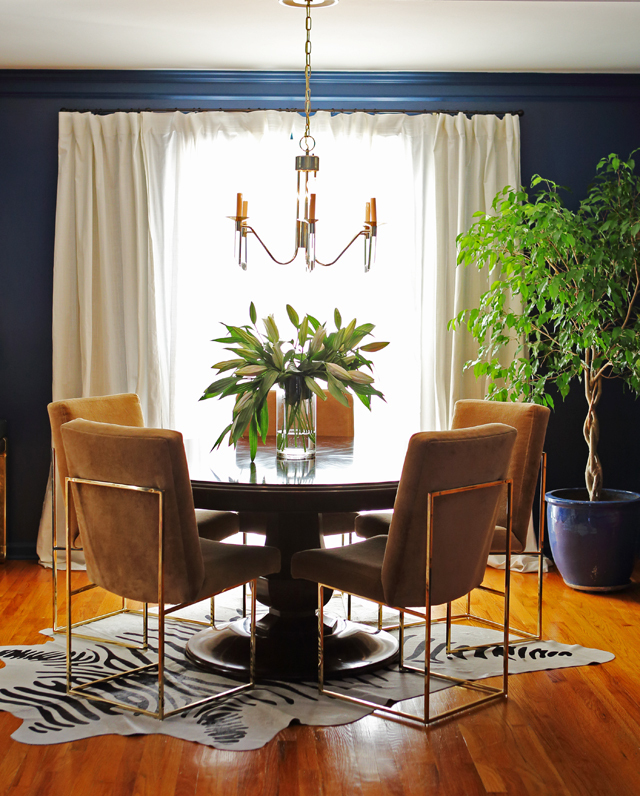 I am so in love with the light fixture, the table and chairs and that gorgeous black chest....a nice anchor in the room. Hope you can relax now! Congrats on pulling together a beautiful space! Your old space was beautiful in its boldness, where the new one is beautiful in its modernity. 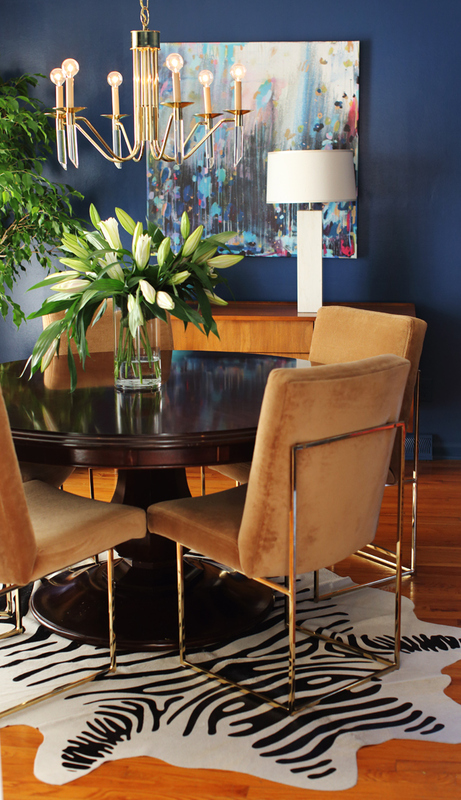 I love the fresh palate and mix of neutrals with hits of green and blue. My favourite elements are the floating built in/shelves and the incredible combo of the medallion and modern light- both masterstrokes. Your new room feels so inviting and definitely looks like it will serve your family in the way you want it to. Amazing work Tobe- loved following along your transformation!!!! It looks amazing Tobe! 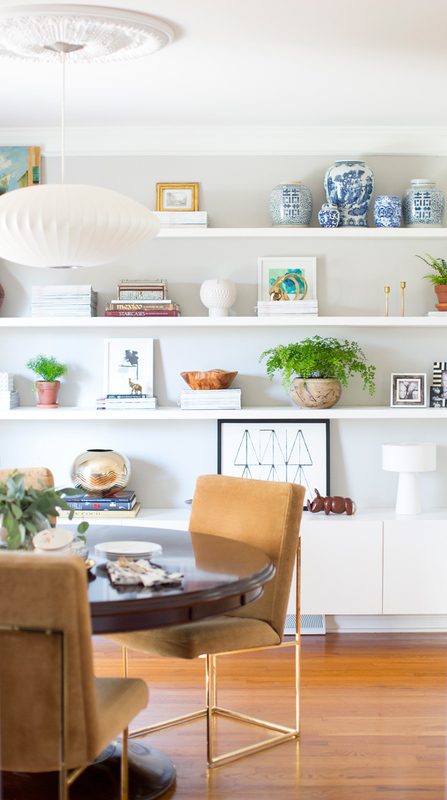 I love how you brightened the room and styled those beautiful shelves! Hello STUNNING! Is it me? or is there way more natural light there? What a fabulous transformation! I liked it before, but LOVE it now. It must have been fun styling the shelves. Looks perfect! What a beautiful, functional space! So well done! 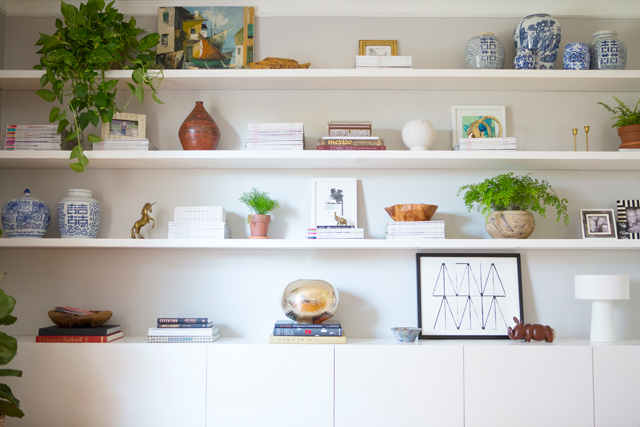 I need floating shelves in my home, and this is my inspiration. Ava is always my favorite accessory. Love the after. What a beautiful room!!! Now you can relax and enjoy. Ava is so darling. It's all so gorgeous. Well done! I love the shelves and how you styled them. Really beautiful. 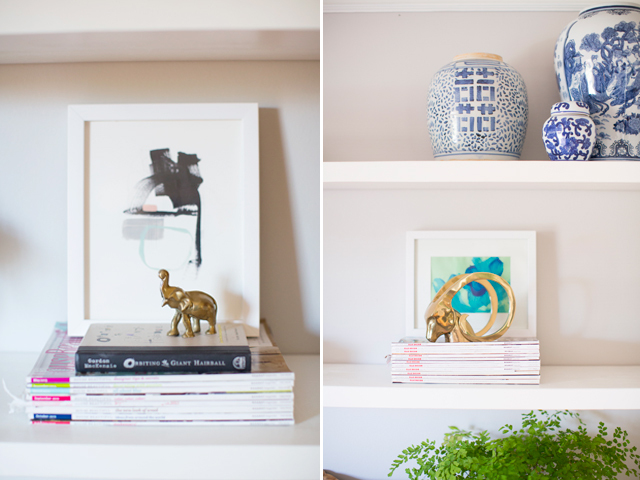 Those shelves are gorgeous and so so beautifully styled! I love that you kept your dining set; it looks wonderful but so different in the new room. The pendant is such a great element, too. Just lovely! Pinning! 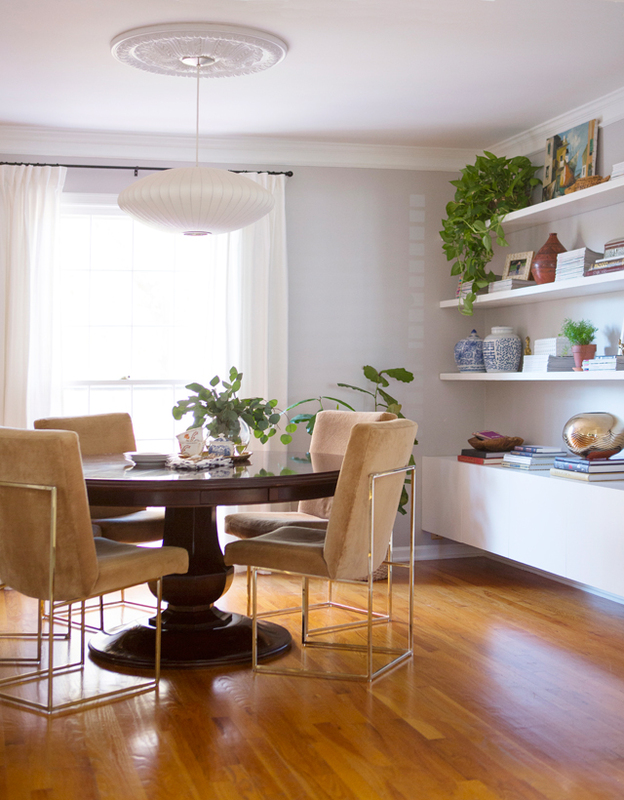 Your dining room looks fabulous, It has a very fresh & open feeling & the storage shelving wall is so perfect! The space looks amazing!! So bright & fresh! I love that removing the hide rug really let's those gorgeous chairs shine! Well done!! It's so light and bright and airy. I love it. Those chairs especially! Congrats and well done. It's beautiful!!! And your chairs- holy cow, they are awesome! 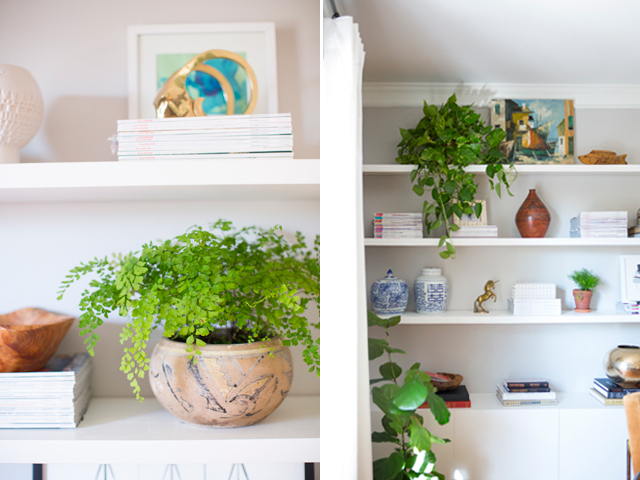 I'm sure that you will love having such a functional space, and yay for organized magazine hoarding! Great job. Wow, it looks amazing! Love how you styled the shelves!! wow! Those floating shelves are fantastic. 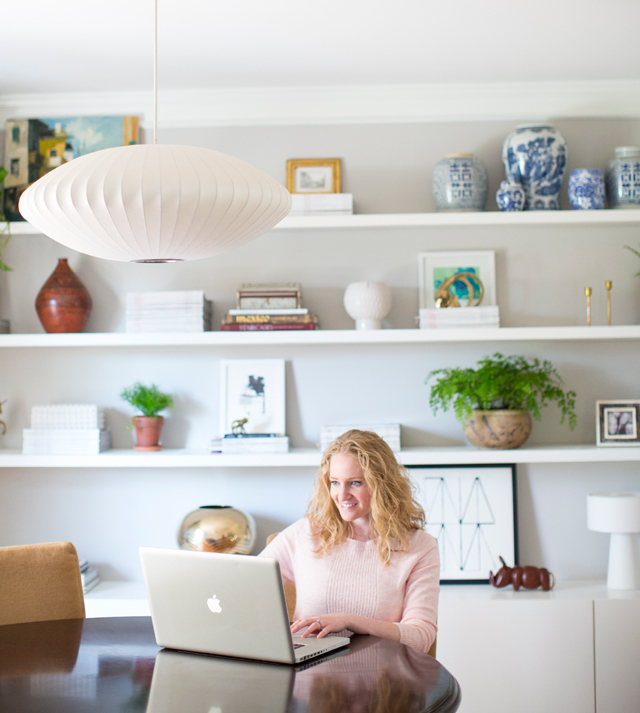 Many of us scoffed that you planned to makeover an already lovely room, but it really does have a completely different vibe now -- fresh and light. The credenza is so amazing, especially considering it was created from scratch. Pat on the back for your hubby on that one! 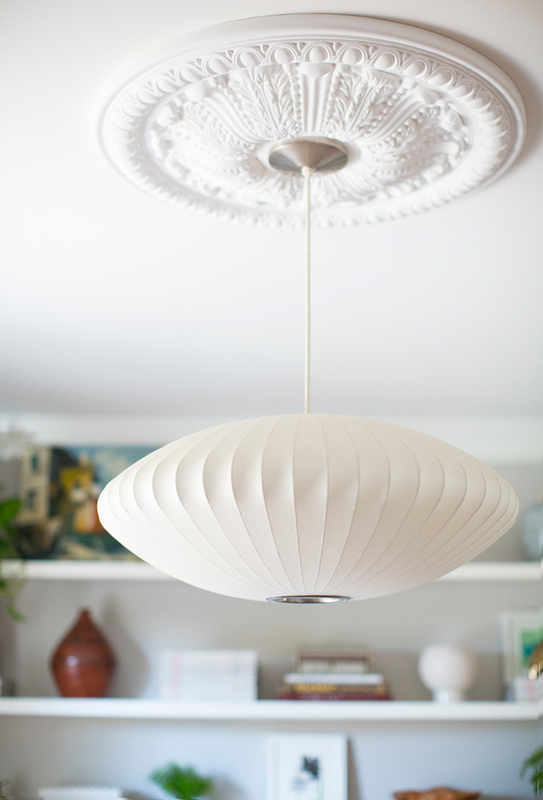 I love the modern/traditional light fixture/medallion thing you've got going on. You'll see that I have done the same in my room! I know it was rough, but it all came together and looks great. Well done! I love how bright and airy it now is and that shelving is seriously awesome. Kudos to your husband! 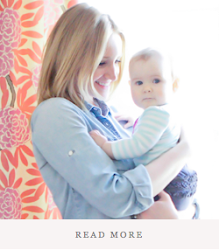 Also, the photos with Ava are so sweet! Loving the shelving! Really nicely done. A very fresh, clean look. Congrats!!! That wall of shelves is amazing! I love the light and bright feel to the space now. I cannot believe you did the ORC while pregnant and with a little one! 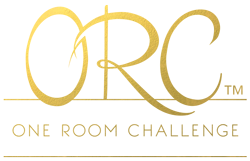 I also took part in the One room challenge, I have 3 kids running around but no pregnancy. You are superwoman!!! Such a beautiful space! That wall with shelving is amazing. Love how everything was arranged in such perfect way. 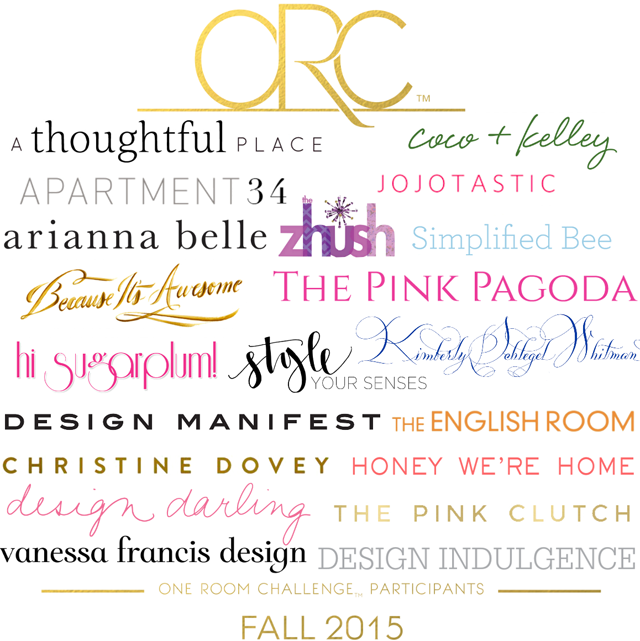 Congrats on completing the ORC! Love the new wall colour - so light and fresh! And those shelves! 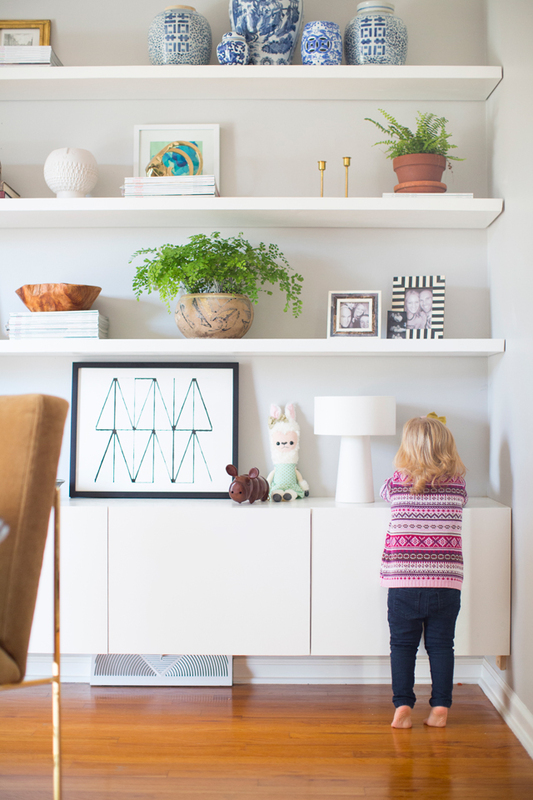 Kudos to your talented hubby for building them and the credenza. Congrats Tobe on a beautiful space! Obsessed (obsessed!) with those shelves and your styling magic. The "before" was lovely. The "after" is spectacular. Get it, girl! It looks amazingly beautiful, and I Love the shelves so perfect!! Drooling. So beautifully done, Tobes! How lovely!! I am dying over your shelf styling. Awesome job girl! Tobe! !1 What a beautiful dining room!! It is a huge change! I love it. 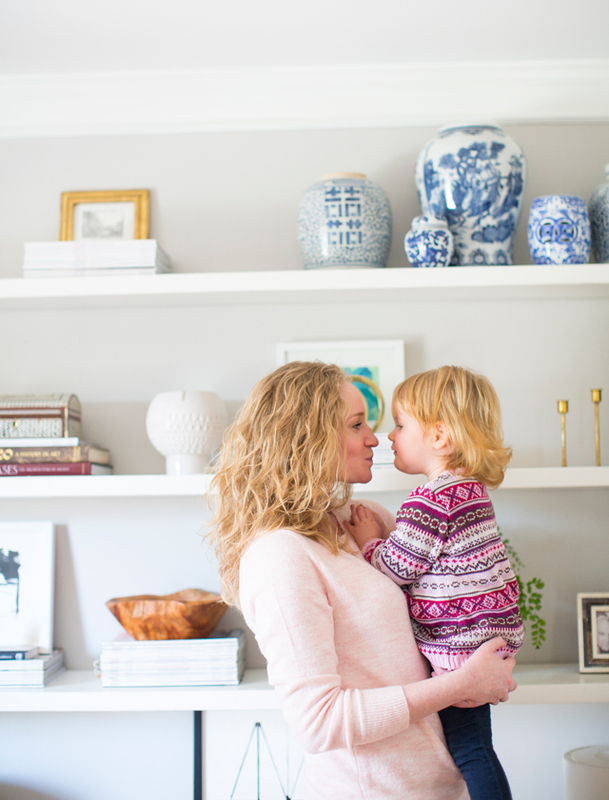 Your dining room before was also beautiful but this is just perfect! Loved the shelving, the brightness the new light....everything! COngratulations!! Wow...what a difference! And I LOVE that you put your babe in the pics...for me there's nothing better than those little feet. My daughter is embarrassed every time I show pictures of her feet when she was a wee one! Great job on the redo. Holy cow! Love the airy and relaxed vibe your sophisticated room still evokes! It's so beautiful! Calm but still interesting. I love the shelves and the styling is totally on point. Great work as always! Wow, it's all so well put together! Especially love the little ornaments all over the shelves. They really complement each other. So relaxed.I work from home too and I know how important it is that your area is really "work friendly" as I like to call it. Loving you place. Hi I just found your blog via another site and what a GREAT stylish page you have here :) I Will come back for sure and I wish you a lovely new 2016 dear. 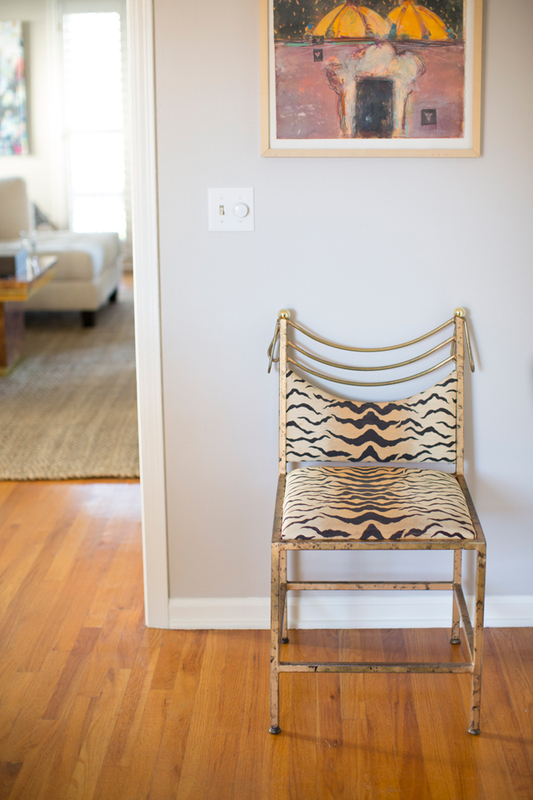 I am in LOVE with your dining chairs, where did you find them? Vintage design reference? I have been looking for the similar frame for my dining space currently undergoing transformation as well, though the bathroom was room that was up for the one room challenge blog post! Beautiful! I love how intimate the atmosphere of the living room is and the shelves are something I would like in my own apartment. A cool thread .. will help me a lot to decorate my place. I really love the open shelves and your props! This space turned out great. Painting a room changes everything, especially when you paint it a lighter color, it really opens up home decor possibilities. I also love that you added the shelving. Not only is it great for your work station now, but shall you ever decide not to run your business it is a great place to store linens for the table and extra dishes.